This book is available on Amazon.com and Kindle. The idea of healing trauma, starting with my own, has interested me since the early 1990s. In my memoir One Small Sacrifice I wrote about the co-counseling therapy I did in Seattle. I was born with PTSD and as a teen had obsessive-compulsive disorder. The trauma I was dealing with was complicated with the sexual abuse I experienced at home. I was very sick a long long time. In Seattle I heard Dr. Fred Alan Wolf describe his experiences with the shamans in South America who were using ayahuasca. Wolf lectured that if victims of PTSD - Post-traumatic Stress Disorder - used this, it would cure them. The mind-body connection is more important than western medicine will tell you. 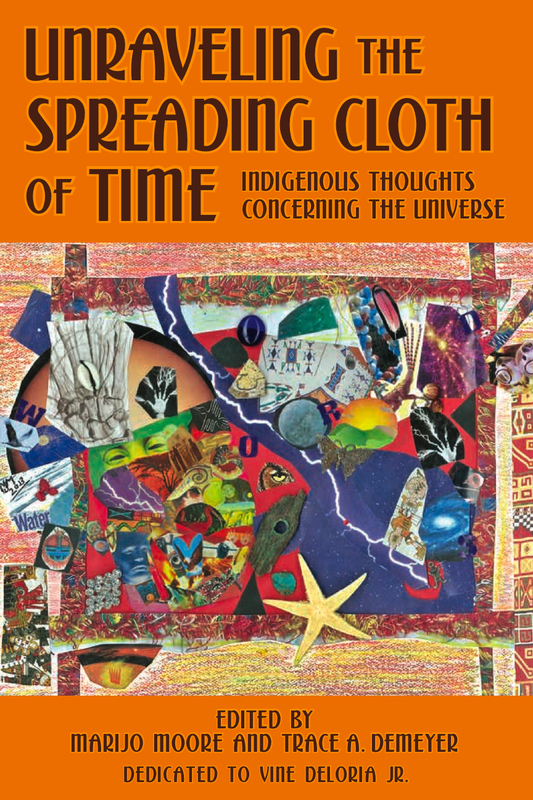 In the new anthology UNRAVELING THE SPREADING CLOTH OF TIME, co-edited with my friend MariJo Moore, I wrote an essay FOUR SOULS, which describes my journey to heal myself and the elders who made it happen. Four is an esoteric number found in tribal cultures, as in the four cardinal directions: east, north, west and south. Many colors have significance: black, white, blue, and yellow. To live in a sacred manner, we are taught to smudge with sage and cedar and pray with tobacco (asemaa in Ojibwe). I bring elders asemaa as a gift. Choctaw elder Mary Barnett shared how tobacco was used for many cures in the Five Civilized Tribes. The Cherokee made a concoction of tobacco juice you drank. Tobacco was one of the most important herbs used by Southeastern Tribes, she told me. My own grandmother Lona and her mother used tobacco. They chewed it, spit it and smoked it. Prayers were whispered in smoke. Tobacco infused with good thought, a ritual act of “remaking” the herb, was good medicine. Elders who became my teachers cured me of illnesses. In Lakota territory, Sara, an Oglala elder cured me of a migraine headache in 1993. I inhaled a chunk of burning root deeply several times. Ellowyn (Oglala) taught me their medicine people could communicate with supreme beings our eyes cannot see. Invisible Gods, sixteen different beings, appear to their medicine people. Healers, both men and women, of many Indigenous cultures, will know people are ill by their vibration. Sacred sound, a drum or rattle or words, can shift our vibration. Our human body is a container of four souls. Seeing in our container, those who can heal us see how we see ourselves. They can shift our perception, and uncover the roots of dis-ease. Not every disease is physical as people experience spiritual sicknesses, too. Here is a link to my other blog LARA which has a very revealing speech by Dr. Gabor Mate who recommends using ayahuasca to heal trauma. 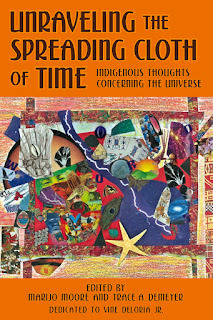 AMAZON review: Unraveling the Spreading Cloth of Time: Indigenous Thoughts Concerning the Universe: Dedicated to Vine Deloria Jr. (Paperback) Fantastic! After reading this book I want to find a place where I can sit and listen to all of these authors while they tell all their stories. This anthology opened the universe and all that I have missed growing up this far without these stories, poems, essays, etc. Past present and future do meld in the universe to teach us from one generation to another, and I must admit I had/have a world of knowledge to learn, share and create. I recently learned that my Great, Great, Great Grandmother was Native American and I missed out on sitting with her learning such wonderful wisdom and stories. Please read this book, you will never regret it and I am certain that anyone who reads this anthology will be blessed through generations and open some long-closed eyes. Marvelous!